Gorgeous litter of KC registered pedigree miniature schnauzer puppies are available to kind and loving homes. Our lovely pet Ruby has given birth to four little puppies. a mixture of salt and pepper and black and silver. Ruby is salt and pepper and dad is black and silver and Ruby is our 5th generation of this line and all have made beautiful family pets. The puppies are being raisedin a busy family home and are used to regular cuddles and normal household noises. The boys are well socialised with people and other dogs. and are starting to show caring yet cheeky little personalities and are definitely little bundles of joy. Their dad is PRA eye tested and the pups will have had their 1st vaccination. worming up to date. will be micro chipped and will have had a full health check at our vets before leaving their mums. They will also leave with a puppy pack including. a blanket with their mums scent on. a bag of the food they are on. their favourite toy and their KC 5 generation pedigree. 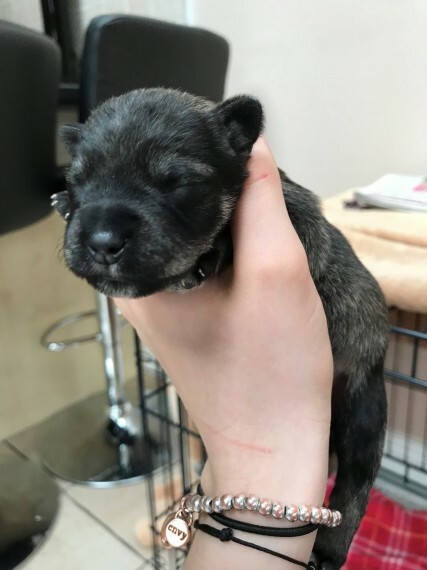 The pups are nearly 4 weeks old will be ready to leave on the 17th June but are available to view now. A 200 .non refundable. deposit is required and will guarantee the pup is yours and regular photographs will be sent to you as your little one grows up.